Praise at the City Gate: Feel the fear and do it anyway. TIMESTAMP: May 4, 9:03 p.m.
Well... I had all these great plans to blog while waiting at the airport to fly home about my amazing experience at Making Things Happen. But, I got here, and lo-and-behold the Hartsfield-Jackson International Airport does not have free wi-fi. In an effort to adhere to a standard of financial responsibility, I just could not bring myself to pay $9.95 for one hour of internet access. I do not need to be connected THAT badly. I mean, gracious, I spent 10 full hours on Thursday with my cell phone OFF and it was like 1993 with the lack of internet in my life. So here it is. Type now, post later. Go time. Without a doubt in my mind, yesterday was one of the greatest days of my life. I gained clarity, I discovered hope, I harnessed strength, I witnessed enlightenment, I felt the all-encompassing power of my faith, and most importantly I pictured and believed in the beauty of my dreams. I was surrounded by a remarkable group of women (not that MTH is girls-only, but our group didn’t happen to have any male attendees.) Women who were open in a way that was absolutely inspiring. I don’t have words to describe the candid way in which these women spoke. I have never experienced such raw emotion and genuine honesty -- and that’s not to say that I don’t surround myself with people who conduct themselves honestly, but when can anyone really say they have been in a room with 22 other people who had completely let down their guard, and without holding anything back, acknowledged the hard truths of their life and embraced them, as well as vocalized their big dreams and taken the first few steps to accomplishing them? Until yesterday, I certainly couldn’t. But today, I metaphorically stand before you to say that I have seen it, I have experienced it, and it is BEAUTIFUL. I’m sure I speak for all of us who were there when I say that the time we invested in ourselves (and, by proxy, in our families and our businesses) was among the greatest gifts we could have given ourselves. Truly, in the society we live in, it is rare that we take a break from the nuances of our everyday life to be still, to reflect, to think, to make decisions, to make discoveries and to examine our lives for what they are, and determine whether we are on the path to the life we deserve. Alright, so enough mushy-gushy, lovey-dovey talk, let’s get down to business. It’s time for real talk. In the effort to remain somewhat private, and protect the privacy of my fellow MTH Alumnae, I will not share with you the exact decisions that I made or anyone else made yesterday. However, I will tell you a few of the things that we all agreed upon to be universal truths. You are far too smart to be the only thing holding you back. We must STOP making excuses -- Fight with yourself. Combat your excuses. Prove yourself wrong. LIfe is too short to not live a life you love, and a life full of big things and accomplishments you’re proud of. Fear is a LIAR. Feel the fear and do it anyway! I want to challenge you today. My first challenge is to take Lara’s Challenge. (Click on the link to go to the post.) 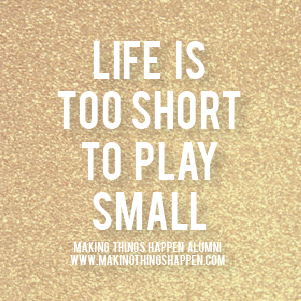 Make a list of your big dreams and start taking the baby steps toward them. Visualize the life you dream of, own it, talk about it the present tense, feel what it would be like to really live it and then allow NOTHING to deter you from getting there. All my love. Go live your dreams. Go get it, girl! It was so great to meet you in person. You are SUCH an encouraging ray of sunshine and I could tell you cared for every woman in that room and you know what? We love you too. If you ever need a push I'll be the pusher. You deserve to be everything you've ever wanted to be and you are well on your way. Girl, you fire me up! Thank you so much for being so encouraging! That sounds like a really great seminar and a great group. I love the phrase "Feel the Fear and Do It Anyway." Its long been my mantra, ever since I read the amazing book by Susan Jeffers. Thanks for the great post.